Shirley Collins and Alan Lomax are at the 1959 Newport Folk Festival, just prior to their great song-hunting ‘Southern Journey’. She finds the festival ‘a great disappointment’ (p.56), due to the liberties the performers take with their material. There’s a singer with a voice which is too operatic (Martha Schlamme), and a band who kid around too much (The Kingston Trio). 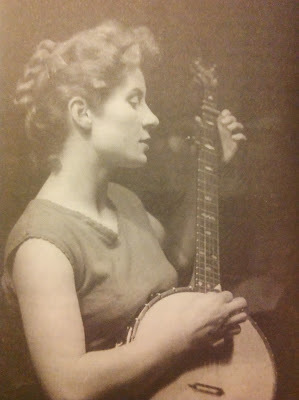 There are other performers she does like, who are less ostentatious, less prone to mix and match styles (Jimmy Driftwood, Jean Ritchie, Frank Warner, Earl Scruggs). Her criticism raises a question about what folk music is: if its great virtue is that it is open to all — a way of history being told, for once, by the losers — then how can rules be imposed by the winners? Disliking a performance is one thing, censuring it for failing to conform to a particular mould is more dubious. Presumably Martha Schlamme intended to sing the way she did, and The Kingston Trio intended to kid around. It’s similar to the old rockism debate, argued firmly on the side of tradition, and against the kind of stylistic hybridity which is the lifeblood of pop music. There is also a class element to what Collins says: she may mean that folk music should only be made by the ‘despised, abused and neglected’, and that modern distortions by performers jumping on the folk revival bandwagon are therefore an affront to and a dilution of a proud outsider tradition. This is from one of the letters home to her mother and sister that Collins gives in their entirety. She’s no mean archivist herself, and includes many letters, postcards and photos in the book. If she can find a piece of writing she did at the time, she uses this directly rather than re-writing, and it helps to capture the spirit of this irrepressible young woman, who seems to have made friends wherever she went. The final chapter, ‘The Ending’, gives a potted history of Collins’ subsequent career and the loss of confidence which led to her giving it up, so there’s a fragility too to the joyous letters from an earlier time. Their spirit won’t be lost, but it won’t remain quite unbroken either.